at the holidays, as he’s been in daycare and preschool since he was 2 and a half. He’s also no stranger to being excluded from these parties and from nearly every food-based activity at school because of his multiple, severe food allergies. He has a rare disorder called Food Protein Induced Enterocolitis Syndrome, or FPIES for short. Currently he has 12 known food allergies and can be allergic to any food he’s never had before. No test exists to see what he’s allergic to, other than feeding him something new and seeing if he gets sick. I’ve become accustomed to sending every single meal, snack and dessert for him to school. He has a lunchbox half the size of his backpack for this very reason. And every time there’s a party or birthday, I send a treat box so he can have something special while the other kids eat the store-bought cupcakes and candy bars and pizzas that always seem to accompany these events. This holiday party I was expecting to do the same, but an email from his teacher stopped me. When I read it, I started to cry. 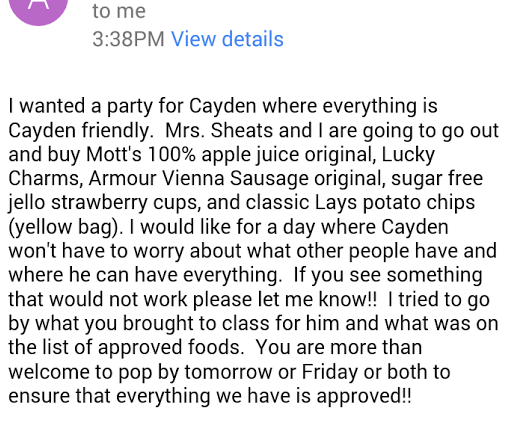 I wanted a party for Cayden where everything is Cayden friendly. Mrs. Sheets and I are going to go out and buy Mott’s 100% apple juice original, Lucky Charms, Armour Vienna Sausage original, sugar free jello strawberry cups, and classic Lays potato chips (yellow bag). I would like for a day where Cayden won’t have to worry about what other people have and where he can have everything. If you see something that would not work please let me know!! I tried to go on by what you brought to class for him and what was on the list of approved foods. You are more than welcome to pop by tomorrow or Friday or both to ensure that everything we have is approved!! His teacher and her aide also sent notes home with the other students saying all food would be provided for the party due to food allergies in the classroom. I offered to make cupcakes so the kids would have those as well. The party was a complete success. Cayden was able to eat everything without fear, and this mom was crying happy tears at the generosity and care of my son’s teacher. She’s made this a holiday party to remember and has set the bar high for his future teachers. We hope our stories help you. Get more like this one by following our topics. Shannon Miskimen is a single mom of two and full time accountant. Between juggling kids, work, karate, meals for multiple allergies, and housework, she likes to cuddle up with her kids to watch cartoons and sleep whenever possible.